Widow of Major Jedan Assad, who was murdered in a car terror attack 4 months ago, has given birth to a son. The widow of Border Policeman Major Jedan Assad, who was murdered in a Jerusalem car terror attack four months ago, gave birth to a son Monday morning. 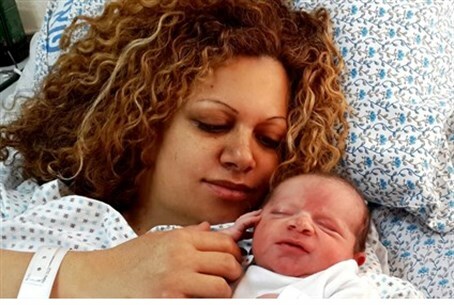 The son was born at a weight of 3.55 kilos (7.8 lbs) at the Ziv Medical Center in Tzfat. In 1995, Major Assad enlisted to the army and joined the Herev minorities battalion. He served as an officer and took part in operations in Lebanon and Gaza. He later served in the Liaison Unit to Lebanon and joined the Border Police about six months after his release. He served for 12 years in the Border Police in Jerusalem, in two different battalions, as a platoon commander and operations officer. When he was murdered in the terror attack, his wife, Darin, was in the sixth month of her pregnancy with the baby, who is her second son from Jedan hy”d. Jedan and a 17-year-old yeshiva student were killed and at 13 wounded in Jerusalem, when a terrorist drove his vehicle into a crowd of pedestrians at the Shimon Hatzadik train station, located on Shimon Hatzadik street north of the Old City and not far from the Municipality building. Jedan was pronounced dead on his way to Hadassah Ein Kerem Hospital in Jerusalem. Several days later, the young yeshiva student succumbed to his injuries.